According to him, “we need a new economy with new pillars of growth. To develop and lead the policies that will generate jobs, jobs, jobs, we need a President who thinks ‘outside the box’ and has productive private sector experience to be able to reform and restructure the economy; to develop the sectors and industries that will provide productive jobs for our young people”. He observed that the country already faces high levels unemployment, saying year, more than 300,000 young people will leave schools and universities to seek jobs. Next year another 300,000 plus and so on, year after year. Add to these, those who are going to school.“We must generate jobs, jobs, jobs for our youth: this is the greatest challenge facing our nation. These are young people who will lose patience with the democratic process and as in South America, they will return to the ‘Junior Jesuses’ and the dictatorships”.Mr. Obetsebi-Lamptey who said that President Kufuor has stopped the rot and built a platform, which the next President must build on it, believes that he is the right and preferred person to lead the country to realise its full dream.The former Tourism and Diasporan Relations Minister appealed to the party members to look at his track record which he described as very enviable, so that they will have no doubt about his capabilities of taking the nation to the “Promise Land”. “As the Greater Accra Regional Chairman, I worked with my constituencies. I know the pressures on constituency and regional executives. I understand what needs to be done for them to get to work even harder for our own government. As a Minister, I stood for and was re-elected as Regional Chairman. I did this to send a signal about how close I believe party and government must be”, Mr. Obetsebi-Lamptey maintained.He added; “after six years in office we must continue to build the party into the natural party of governance. The party that will entrench the NPP’s vision of Ghana as ‘a property owing democracy’. We need to have the party and the government working more even closely together. We need to professionalize the party and make it into a viable institution and not just a club”.He stated that there are three attributes that the delegates should look out for when voting, and that each of the areas, they should look at the track record of the candidates to be sure they can deliver on any promises they make.He said they should vote for President of Ghana and not President of NPP, a President who will build a more prosperous Ghana, as well as a President who will professionalize and institutionalise the NPP. 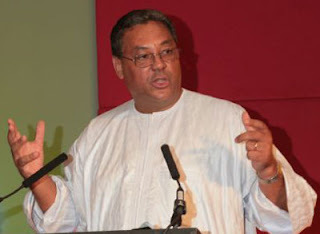 Mr. Obetsebi-Lamptey who is very confident of emerging as the flag bearer of the NPP at its extra-ordinary congress slated for December 22, remaindered members of the party not to be over confident, and that they must not assume that their flag bearer will automatically become President of Ghana, stressing that, in 2004, after only one term, with an incumbent President and better resourced than they had ever been, they still got only 52.5 percent of the Presidential vote and 51.5 percent of the Parliamentary vote.“We need a candidate who can galvanize our supporters and then reach the floating voters and the non NPP voters. We need a candidate who knows how to win a general election. In both of these areas, I say please consider me. As two times, successfully campaign manager, especially in 2000 when so many doubted that we could win, I know how to devise and implement a winning strategy. I did it for JAK, I can do it for JAKE”, he emphasised.